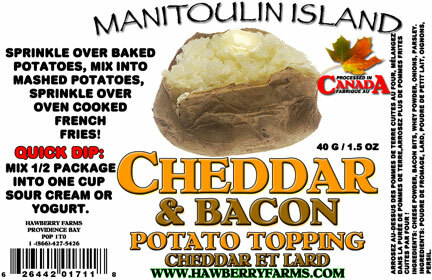 Click the button below to add the Cheddar and Bacon Potato Topping Party Pack to your wish list. Sprinkle over baked potatoes, mix into mashed potatoes, sprinkle over oven cooked french fries! Ingredients: cheese powder, whey powder, simulated bacon, onions, parsley. The product tasted excellent. The problem I had with it was that it was hard as a rock and I had to chip away at it to scrape the product off the rest of it to use it. I'Ve had a few other HAWBERRY farms products in the past which were excellent so this definitely is not the norm.